This is a common question that comes up quite often. Our first experiences tackling this question happened on a daily basis while growing up in our families fly shop in the Eastern Sierra. The answer was a book that we ended up carrying case upon case of in inventory and literally sold thousands of copies. We still get the question today as fly fishing guides and we still after all these years have the same answer. Author of the number one source of information for the first time fly angler. To be honest, there is no such book on the immense and broad subject of fly fishing that covers everything you need to know for the first time angler. The book would have to be several hundred pounds and come with its own gurney. There are a plethora of books and articles out these days that are aimed at the beginner fly angler. In fact, the massive fly fishing resources available to the modern angler is astounding compared to not that long ago. Online magazines, blogs, podcasts, schools, classes, clubs and guided fly fishing trips seem to fill every drop of water across all fifty states. Some of the books are too short and touch on the need to know subjects but content wise they are almost worthless and can discourage somebody looking to get into fly fishing. Other publications are in depth and too technical to the point of often overwhelming novice fly anglers. 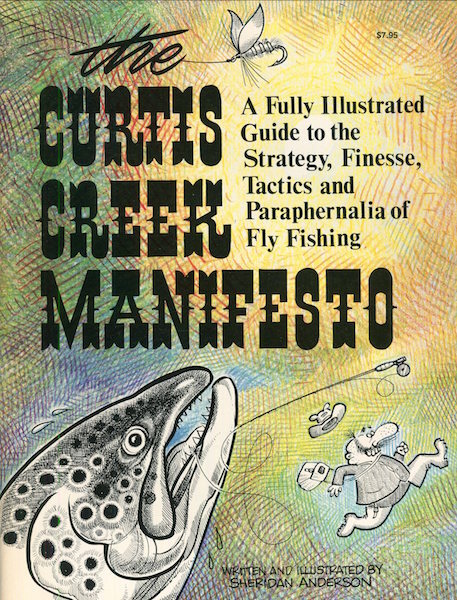 If I had to recommend one book for the beginner fly angler that is easy to read and straight forward in it’s approach it would be without question Sheridan Anderson’s, Curtis Creek Manifesto. It’s a practical and informative for beginners thats contains spot on content and illustrations combined with brilliant wit and humor. Between the covers encompasses fly rods, fly reels, fly lines, how to select a fly, how to read different types of water, fly casting, entomology, hook sets and fighting fish, fly tying and how not to take this thing called fly fishing so serious. Since being published by Frank Amato in1978, the book has lodged itself as an eternal pillar in the fly fishing world where we are confident as are many others that it will remain. It is estimated that over one million copies have been sold. Need a last minute Christmas gift for any fly angler? This is a great addition for even the accomplished angler. This entry was tagged Classic fly fishing literature, Curtis Creek Manifesto, Fishing books, Fly fishing books. Bookmark the permalink.